When applying for an ASIC you’ll need to verify your identity. Effective 1 August 2017, the types of identity documents you need are changing. There will be four categories of supporting identification documentation. The original documents must be presented in person, by the applicant at ID and Access Services. Only original documents will be accepted. You’ll need to present a minimum of three identification documents. One from category A, B and C. Please note, category D documentation is only required if the category A, B or C documents do not display proof of your current residential address. The following documents will not be accepted unless the following circumstances apply. 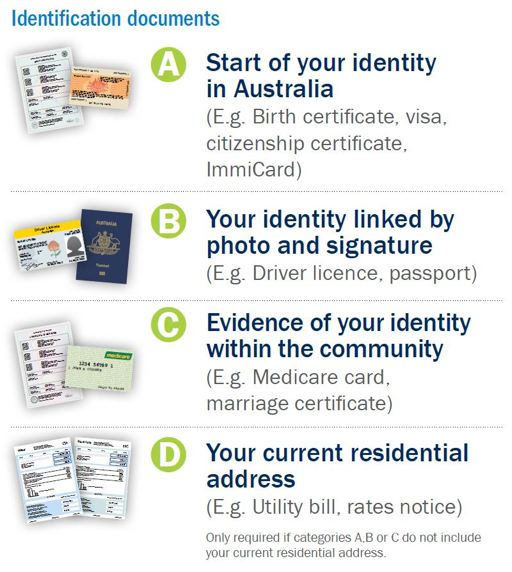 Documents showing a different name Your identification documents must contain exact name matches, unless the name variation is supported by a linking document. Acceptable examples of change of name linkage documents include marriage certificates, change of name certificates and deed poll. A statutory declaration is not an acceptable change of name linkage document. Documents in a foreign language Foreign language documents must be accompanied by a professional translation. An acceptable translator is the National Accreditation Authority for Translators and Interpreters (NAATI). Visit the NAATI website to locate a translator. Alternatively, phone (02) 6260 3035 or email: info@naati.com.au for further information. In New South Wales, the Community Relations Commission (CRC) for a Multicultural NSW employs NAATI accredited translators. Translations on CRC letterhead that are certified as an extract translation of the document(s) and include the ID number of the translator are acceptable. Please note: if you’re presenting a document translated overseas – please contact your local mission or consulate to validate the validity of your documents and translations. Effective 1 August 2017, Sydney Airport has changed the requirements for overseas police certificates from 10 years to five years. If you apply for an ASIC application and you have continuously resided in a foreign country for more than six months, an overseas police certificate is required for each country you resided in. An ASIC application may be accepted without the overseas police certificate however, the ASIC will not be issued until the police certificate is provided. Sydney Airport may cancel an ASIC application where the applicant fails to provide evidence that they have applied for an overseas police certificate within 28 days. Overseas clearance must be provided from either a Consulate or Law Enforcement agency of the country you resided Visit this link to find out how to apply for clearance from each country.